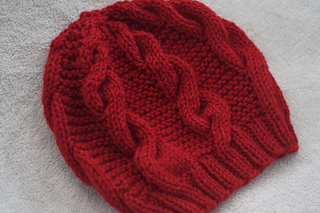 This hat is worked in the round from the bottom up, starting with a ribbed brim. Simple, staggered cables and soothing garter stitch in bulky yarn make this a quick, fun and relaxing knit. Crown decreases are incorporated into the stitch pattern. The fabric is stretchy and cosy! Heavy Aran / light bulky weight: 120 (150) yards. Fitted version is pictured in De Rerum Natura Cyrano in the colourway ‘Dore’ (gold). Slouchy Version is picture in Brooklyn Tweed Quarry in the colourway ‘Lapis’ (blue). US8 / 5mm - 40 cm long circular needle for the brim. US10 / 6mm - 40 cm long circular needle - for the main body of hat. US10 / 6mm dpns or 80-100 cm long circular needle for magic loop method for the crown. 6 stitch markers, tapestry needle. 16 sts & 30 rows per 4 inch / 10 cm square in garter stitch on larger needle. Adjust larger needle size if necessary to get correct gauge.